For centuries it has been difficult for critics to imagine what serious plays written for children’s companies would be like, but the opening of the Sam Wanamaker Playhouse this year has changed that. Not only is the Wanamaker a replica of a typical indoor theatre of the period, lit primarily by candlelight, London’s Globe Theatre has formed a children’s company, the Globe Young Players, to perform those plays that would have originally been staged by boy actors. 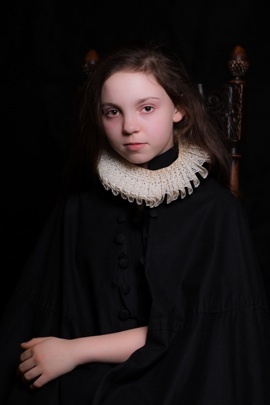 The one concession to the modern period is that it allows girls to join the group of actors aged 12 to 16. While boys would have originally played all the parts, in the GYP girls are also allowed to play male roles. The effect is quite unusual. To have children playing adults creates a built-in distancing effect so that the audience is always aware at some level of the artificiality of the play. The effect also has a satirical edge when we see mighty men and women played by children. Playwrights like Marston, who are primarily satirists, are quite aware of this and play with the paradox of having actors who have not yet hit puberty speak with sexually charged language of cuckoldry, prostitutes and pimping. It is this sort of practice that caused Puritans of the period to call children’s companies immoral. Today we can see that someone like Marston is playing with our concepts of innocence and experience, usually by making the world of his plays a mirror that reflects in miniature the sins of its audience. So it with The Malcontent. Before the action of the play, Altofronto (Joseph Marshall) has been banished from the dukedom of Genoa by a coup staged by Mendoza (Guy Amos) to put Pietro (Ben Lynn) on the throne since he is married to Aurelia (Martha Lily Dean), the daughter of a powerful Florentine leader. 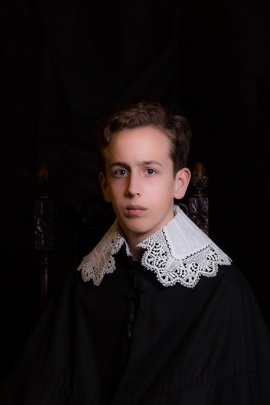 Altofronto, however, has returned to court disguised as the jester-like Malevole, the malcontent of the title, who wins Pietro’s affection by his refusal to flatter and by his scathing satire of contemporary morals. Meanwhile Altofronto’s beloved Maria (Amanda Shodeko) awaits his return in prison. Only Altofronto’s friend Celso (Yasmine Prince) knows his identity and keeps him informed of plots at court. The action begins when Malevole tells Pietro that Aurelia is cuckolding him with Mendoza in an effort to drive a wedge between Mendoza and Pietro. When Mendoza thwarts Pietro’s plan to discover him with Aurelia, Mendoza and Aurelia plan to murder Pietro so that Mendoza will become Duke of Genoa. Fortunately, Malevole learns of this plot and arranges a counterplot to reveal Mendoza’s villainy and return himself to the throne. 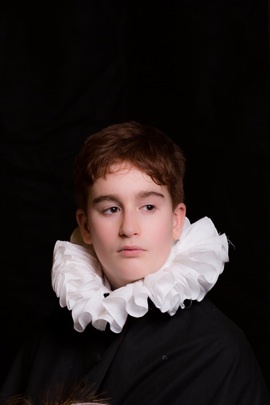 Since the Globe Theatre charges the same amount for plays performed by the GYP as by adult actors, the young actors have to be subject to the same level of criticism. It’s an unusual situation, of course, but just as adults are judged by how convincing they are when they play the roles of children, so it should be when children have to be judged on how well they play the roles of adults. The cast is quite uneven, but the surprise is that their overall level is like that of university students and above rather than the 12-16-year-olds they are. One clear standout is Guy Amos as Mendoza. Despite his small stature he has a commanding presence on stage. The clarity of his line readings shows he knows how to communicate the subtleties of 17th-century English, something that some actors twice his age cannot do. The result is that we soon cease regarding him as a child playing an adult role and are affected by the role itself. The same effect occurs with Ben Lynn as Pietro and Alexander Clarke as the old marshall Bilioso. Because The Malcontent is so full of references to Shakespeare’s Hamlet, directors often try to force Pietro into the mold of an unscrupulous Claudius. That approach, however, does not square with Pietro’s personality at all, particularly with his friendship with a truth-teller like Malevole. What Ben Lynn gives us is a remarkably mature view of Pietro as someone bowed down by the guilt of having usurped the crown, rather like Shakespeare’s Henry IV. This approach already helps point to Pietro’s later decisions to quit the court and takes up a secluded life. As for Clarke, his shuffling old man may physically be a bit of a caricature, but he has a full understanding of the comic nature of his character who so emphatically chooses to side with whatever seems the winning faction of the moment, even when his self-contractions are obvious to everyone. Given that the 12-16-year age group is the one to experience growth spurts, members of the cast are of radically different heights. One of them even has a beard. Of the older boys, Sam Hird is hilarious as the female pander Maquerelle. Twice as tall as most of her clients he creates the effect of the Nurse from Shakespeare’s Romeo and Juliet gone bad. Hird fully plays up the contradiction between Maqurelle’s airs of propriety and her inability to utter a sentence without a bawdy phrase or insinuation. Among the girls, the clear standout is Martha Lily Dean as Aurelia. She is so intense in her actions and so nuanced in her speech, you feel as if you are watching a great actor who is diminutive only in physical size. This paradox, of course, is one of the sources of the children’s companies’ popularity. The one actor in a major role who can’t quite pull it off is Joseph Marshall as Altofronto/Malevole. One gauge of the complexity of this role is that when the RSC staged the play in 2002, Anthony Sher was assigned the part. Malevole is basically Marston’s variation on Hamlet, a young man of satirical wit awaiting the perfect moment to take his revenge. Hamlet may put on an “antic humour” as a mental disguise, where Altofronto goes one step further by changing his name and donning a physical disguise as a noble rogue. What makes the character intriguing is seeing how much of Malevole’s general satire of humanity is informed by Altofronto’s bitterness at his own situation. Still, the actor playing Malevole has to be able to distinguish the deep cynicism of Malevole from the adventurous optimism of Altofronto. These are the distinctions that Marshall just can’t manage. He definitely has stage presence and conveys a strong streak of mischief, but the subtler aspects of this supremely difficult character pass through his grasp. Yet, he shows so much promise I’d gladly see him in another role. When the RSC staged The Malcontent in 2002, director Dominic Cooke relocated the action to an unnamed Latin American country in the 1970s and gave the play an aura of film noir that did not suit its satire. While Anthony Sher gave a riveting performance as Malevole, the plot itself was difficult to follow. Here director Caitlin McLeod has directed the period-costumed piece with admirable clarity. The plot’s twists and turns are pleasures not conundrums. 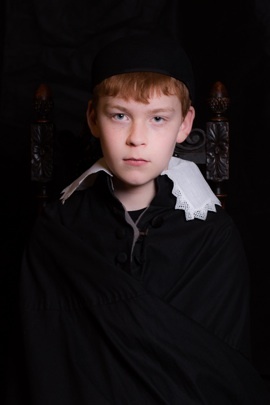 Enacted as it was intended by children, the play takes on a quality that relates it less to the gruesome Jacobean plays by Webster and Ford to follow and more to the romances Shakespeare’s final years of writing. For the first time The Malcontent seems like a kind of satiric fairy-tale where good triumphs over evil of its own accord. One simply has to have the patience that Malevole unwilling possesses to see the evildoers hoist themselves on their own petards. In this the Globe Young Players prove themselves invaluable in giving lovers of 16th- and 17th-century drama an insight into the work they would never otherwise have. After the success of the Sam Wanamaker Playhouse’s first season, I am anxiously looking forward to the next. Photos: (from top) Poster for The Malcontent; Joseph Marshall, who plays Malevole; Ben Lynn, who plays Pietro, Guy Amos, who plays Mendoza; and Martha Lily Dean, who plays Aurelia. ©2014 Helena Miscioscia.